A number of years ago, I saw a documentary about a style of municipal garden design derived from the Netherlands. What stuck in my mind was an image of subtle grasses and perennials in beautiful swathes with a meandering path running through them. In the programme this was contrasted with the traditional formal type of park with manicured edges. Last Sunday we visited a private garden in the Wye Valley that reminded me of the programme. Barn House is only minutes away from the Village Shop, but being along a narrow single-track road through a wooded valley it felt we were somewhere much more remote. The fact that when we arrived we were directed to parking in a field reassuringly indicated a well organised event. The garden belongs to Kate and Hitesh Patel, who, surprisingly only started creating it pretty much from scratch around 7 or 8 years ago. We arrived early and were first to take advantage of the comfy gazebo from where we could survey the one acre garden below. The feeling was that we were in a special place. As we explored, I loved the softness of colour - which Kate Patel referred to as Wimbledon Colour. In the Autumn, the palette is more strident apparently – but I’m sure equally as gorgeous. Notwithstanding, the Wimbledon Colour palette has many deep intense oranges and reds working alongside the violets. As in a good painting, the colours worked together. Nothing was too busy or fiddly or out of balance. There was contrast at the same time as unity. 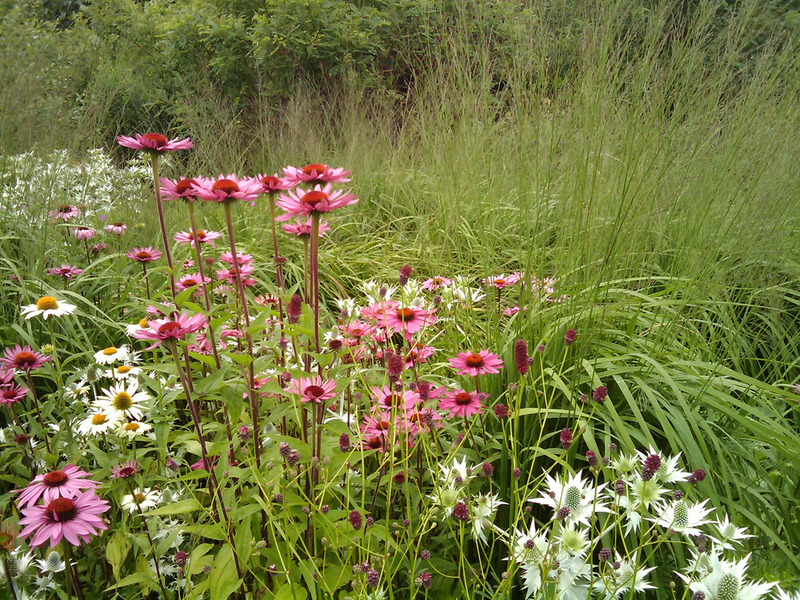 The garden celebrates grasses, which Kate and Hitesh collect. Included are impressive yellow-stemmed giant bamboos beautifully set against fiery red Monbretia currently in flower at their base. The grasses seem to act as neutrals in a painting – a supporting structure against which the more intense colours such as Cannas can sing. Along with blocks of plants such as Fennel, Echinacea Cosmos, Verbena and Veronicastrum, the grasses create softness and flow in the garden - capturing and transforming the light. Since visiting the Patel’s garden, I have done some Googling and reacquainted myself with the Dutch designer most famous for using grasses and less “cultivated” perennials - Piet Oudolf. I’ve been enjoying photographs of his beautiful painterly planting schemes. Hopefully I’ll visit some of these gardens too. Barn House is open twice a year as part of NGS and by appointment over the summer. I have a feeling I will want to go back for another visit!